The NSW Government and Charles Sturt University (CSU) have partnered under the Government’s Boosting Business Innovation Program to develop an Indigenous Entrepreneurship Pop-Up Innovation Hub to support Indigenous business innovation. 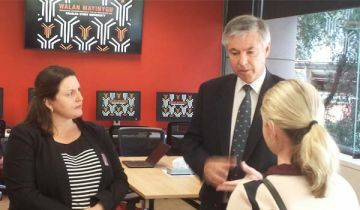 Deputy Premier and Minister for Small Business, John Barilaro, said the ‘Walan Mayinygu Indigenous Entrepreneurship Pop up Innovation Hub’ will help Indigenous people interested or already engaged in local business, to expand their business skills and take advantage of the unique business opportunities around them. “Our Indigenous business sector is extremely diverse covering all spectrums of our economy – professional services, tourism, importing and exporting, mining, defence and civil contracting, landscape design, trades and artists to name just a few,” Mr Barilaro said. Parliamentary Secretary for the Deputy Premier and Southern NSW, Bronnie Taylor said the hub offered benefits to indigenous businesses throughout regional NSW. “Targeting regional areas, the hub will be established for a week at a time in Lismore, Dubbo, Albury and Port Macquarie to develop regional indigenous businesses,” Ms Taylor said. Member for Albury Greg Aplin said it was an honour to launch the Pop Up Hub. CSU Vice Chancellor Professor Andrew Vann said through the Boost program CSU will develop a 'Multi-Region Hub Program' to continue its 100 year tradition of engaging with communities and industry to drive innovation and entrepreneurship.